Congratulations to Veteran Scholarship Recipient, Joshua Watrous! 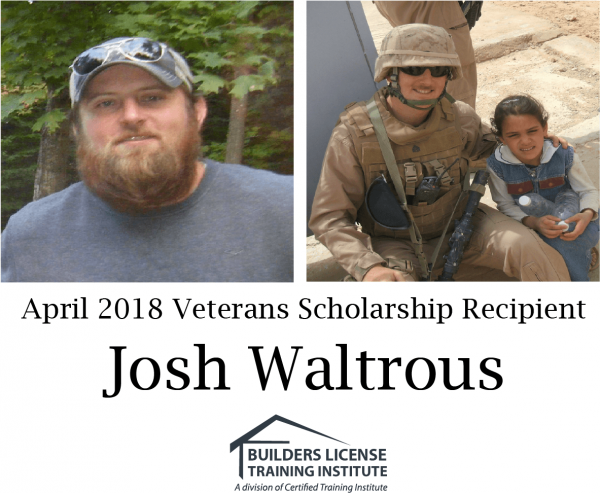 Joshua E. Watrous from Bellaire, Michigan is Builders License Training Institutes April 2018 scholarship recipient. Joshua a United States Marine Corp Veteran served five years and received many awards and decorations, including a Navy and Marine Corps Achievement Medal, Combat Action Ribbon, Presidential Unit Citation, Armed Forces Reserve Medal with M-Device, Rifle Expert and a host of others. Waltrous is a second generation builder who has been working side-by-side with his father since he was a small child. Getting his Michigan Builders License and growing the family business is all he's ever wanted to do. Congratulations Josh! We're thankful for your service and wish you great success in continuing on in your father's footsteps. It is our honor to award you with this month's scholarship. Builders License Training Institute is dedicated to providing opportunities for individuals interested in obtaining a Builder or Contractor license nationwide. We provide scholarship opportunities for Veterans and Students interested in Prelicensure Courses or Exam Prep. If you or someone you know would make a good candidate for our scholarship program please download the appropriate link from our Financial Aid & Scholarships page to get started! Congratulations Josh, we're proud to offer you this opportunity to build a better tomorrow! This entry was posted in Construction and tagged Michigan Builders, michigan builders license, Michigan Builders Prelicense Course, Scholarship Winner.